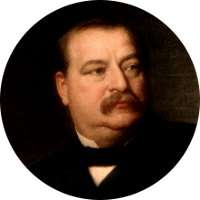 Grover Cleveland holds the distinction of being the only person to have served two non-consecutive terms as president of the United States. As such, he is counted twice in the numbering of presidents and is referred to as the 22nd and 24th President of the United States. He is also the only president to be issued two separate coins in the Presidential Dollar series by the U.S. Mint. He was born Stephen Grover Cleveland on March 18, 1837 in Caldwell, New Jersey to Richard Falley Cleveland and Ann Neal. Grover Cleveland served in a number of political offices before becoming president. He was Sheriff of Erie County, New York, in the early 1870s. He went on to serve as the Mayor of Buffalo and Governor of New York before becoming president in 1885. In 1908 Grover Cleveland suffered a heart attack and died. Grover Cleveland is kin to more than a dozen U.S. presidents and to members of the recent royal family including Princess Diana, Queen Elizabeth II, and the Dutchess of Cambridge Catherine Middleton. As a former Commander-in-Chief of the U.S. armed forces, it's only fitting that he be related to such celebrated generals as General Robert E. Lee, General William Tecumseh Sherman, General George S. Patton, and General Douglas MacArthur. There are plenty of television and film celebrities with connections to President Cleveland such as Lucille Ball, Brooke Shields, Glenn Close, and Clint Eastwood. One of the more interesting connections is to both accused murderer Lizzie Borden and actress Elizabeth Montgomery who ironically portrayed Lizzie Borden in a movie. Another interesting although more distant connection is to that of New Yorker author Anthony West. Anthony West was the illegitimate son of author H.G. Wells and Cicily Fairchild, or better known as author Rebecca West.